To start accepting payments on your store through PayPal payment gateway, you need to enable PayPal payment option and add your PayPal API credentials. In your PayPal account, go to Summary => Seller preferences. Click Update in your API access settings. Proceed with Manage API credentials. Copy your API Username, API Password and Signature. 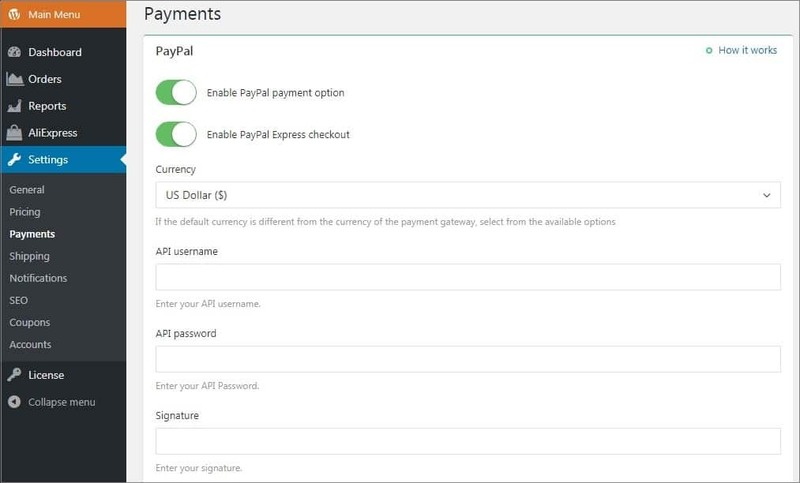 Go to AliDropship Settings => Payments to enable PayPal as your payment gateway. To provide your customers with possibility to complete their purchase on your website without entering password or credit details of their PayPal account, activate the respective option – PayPal Express Checkout. Add your API username, API password and Signature. Choose your payment currency from the drop-down menu. To enlarge the list of available currencies, you may select more of them in Settings => General => Additional Currencies. In other words, all the chosen additional currencies will be available to you in PayPal settings. Enter your PayPal email, brand name of your store and upload your website logo so that your PayPal checkout looks more professional. Click save Changes. NOTE: If you cannot find PayPal credentials on your account, please contact PayPal support directly and ask where you can find API settings.